Eyeris is a suite of quality video conferencing tools, bundled together as a complete solution delivered straight to your premises – including high-definition (HD) TV screens, HD video conferencing cameras, and a touch screen remote. Implementing point-to-point or multi-point video conferencing will save you time and money, promote remote collaboration, and slash the travel budget, ensuring real return-on-investment (ROI) for this fully mobile media bundle. No lag or gaps: HD audio and video quality means all parties are crystal clear, so your meetings run smoothly and productively, with natural speech flow. Reduce travel costs and still enjoy “face time” with remote colleagues, teams, and customers at up to six points. Plus, there’s no upfront capital layout. Eyeris allows you to share your desktop and apps effortlessly to all participants to ensure that nothing is missed. Yes, it’s quality HD video capable, but the cutting-edge technology of Eyeris keeps bandwidth costs low – just another bonus for the budget. How do I connect using the hosted bridge facility? All parties will dial the same number (IP or ISDN) and enter the same meeting ID supplied by Vox. It allows one-to-one connectivity on demand to anyone outside your company network over ISDN and IP. Do I require a lot of bandwidth to make a VC call? You need at least 460Kbps for business quality calls and the more bandwidth is used, the better the quality. What equipment is included in the Eyeris bundle? 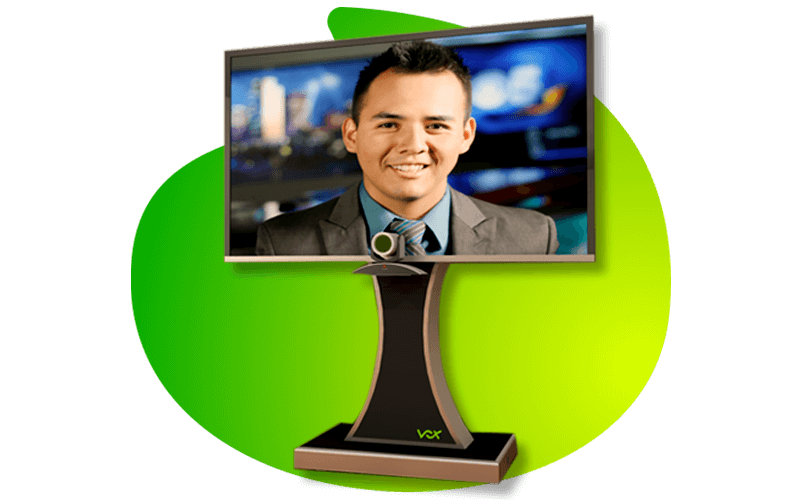 The Eyeris bundle includes all of the hardware required to facilitate an HD video conference call, i.e. LCDs, video conferencing system, multipoint bridging. What else is included in Eyeris bundle? Not only do you get a mobile video conferencing solution for your office space, but you will be able to join the conference from any device by using the free bridging service that’s included in the solution.